Brad Jr Manikin Torso w/Electronics by Simulaids. 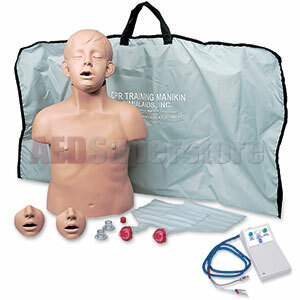 Includes: CPR Brad Jr Manikin, Electronic Feedback of Hand Position, Compressions & Ventilations, 3 Disposable/Lung Airway Systems, 3 Channel Design Mouth/Nosepieces, Nylon Carry Bag/Kneeling Pad, and 3 Year Factory Warranty. Not made with natural rubber latex.